Available color systems are dependent on the medium with which a designer is working. When painting, an artist has a variety of paints to choose from, and mixed colors are achieved through the subtractive color method. When a designer is utilizing the computer to generate digital media, colors are achieved with the additive color method. When we mix colors using paint, or through the printing process, we are using the subtractive color method. Subtractive color mixing means that one begins with white and ends with black; as one adds color, the result gets darker and tends to black. The CMYK color system is the color system used for printing. Those colors used in painting—an example of the subtractive color method. If we are working on a computer, the colors we see on the screen are created with light using the additive color method. Additive color mixing begins with black and ends with white; as more color is added, the result is lighter and tends to white. The RGB colors are light primaries and colors are created with light. Percentages of red, green, & blue light are used to generate color on a computer screen. The Visible spectrum consists of billions of colors, a monitor can display millions, a high quality printer is only capable of producing thousands, and older computer systems may be limited to 216 cross-platform colors. Reproducing color can be problematic with regard to printed, digital media, because what we see is not what is possible to get. 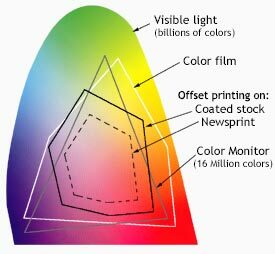 Although a monitor may be able to display 'true color' (16,000,000 colors), millions of these colors are outside of the spectrum available to printers. Since digital designs are generated using the RGB color system, colors used in those designs must be part of the CMYK spectrum or they will not be reproduced with proper color rendering. Working within the CMYK color system, or choosing colors from Pantone© palettes insures proper color rendering.